This year for World Water Day, we welcomed women from 8 Saha villages: Chanbuligu, Kuchani, Defisa, Wovogu, Wovogumani, Nomnayili, Guma, and Kujeri. Rain the night before made getting some of the women to Tamale more difficult, but everyone eventually arrived safely! While we waited, we played the simple but very fun “Stump!” a Saha original game. Our team led a lively discussion with the women by posing questions that got the entreprensurs talking and sharing ideas. They talked about difficulties with dry dugouts and using motorkings and donkey carts to bring water from further distances during the dry season. When discussing marketing and advertising, one woman shared that she has told her customers that if they come with their child, and the child has a small container, she lets the child fill their container for free! The women discussed savings strategies in depth. 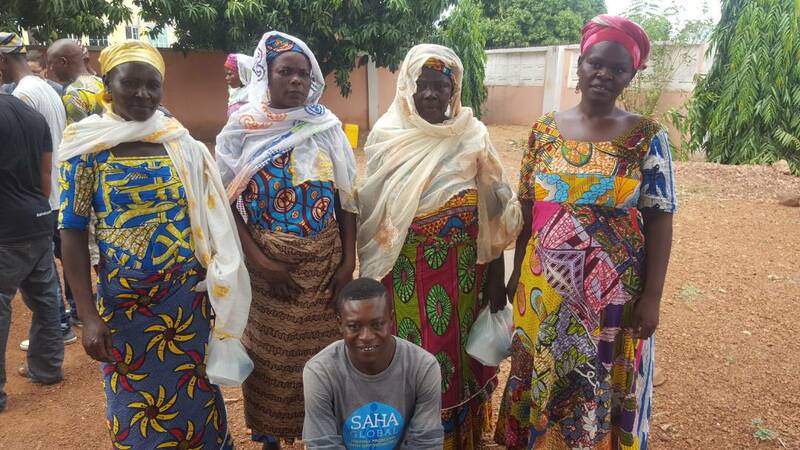 Saha does not pay the women they need to save any profit they make in order to buy any replacement parts if things break. 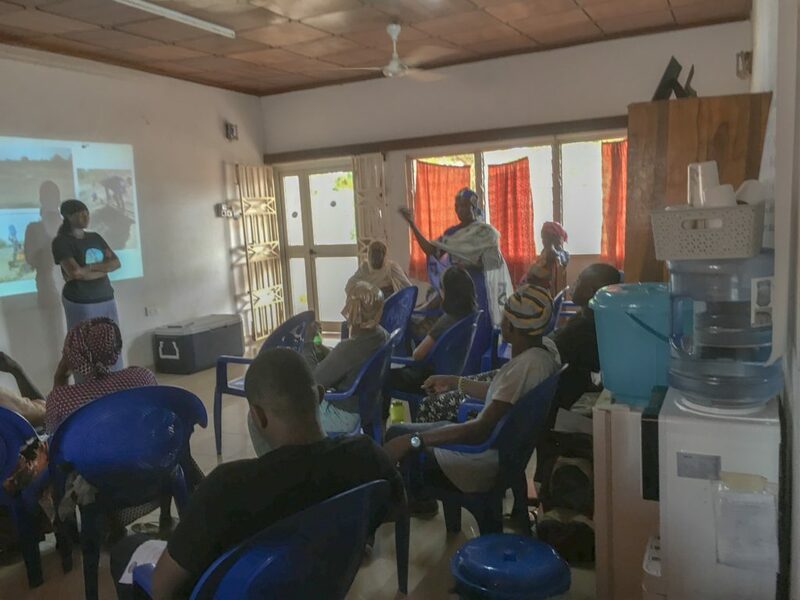 Mariama from Nomnayili is working with a microfinance NGO and has been able to save a truly impressive amount of money in the three short months her business has been running! Other topics included health and sanitation, community involvement with the businesses, and the larger picture of the Saha mission. After the discussions, we had lunch and the group socialized and of course, took some selfies! Our goal for the day was to have the women meet and share ideas, show them some appreciation for their hard work, and have them leave with a better understanding of what a large community they are truly a part of! Some of our villages are very geographically isolated, so we want them know that there are literally hundreds of other women who deal with the same challenges they do! Thank you to Sachiya and Samata from Wovoumani, Ishatu and Asana from Wovogu, Warihana and Sumaya from Chanbuligu, Mariama from Nomnayili, Mariam and Adisa from Kuchani, Abibata and Zeha from Defisa, Ayi and Maimunatu from Navali Guma, and Asana and Abuo from Kujeri for joining us! Kujeri, Navaili Guma, Nomnayili & Nyantag – 1 month update! 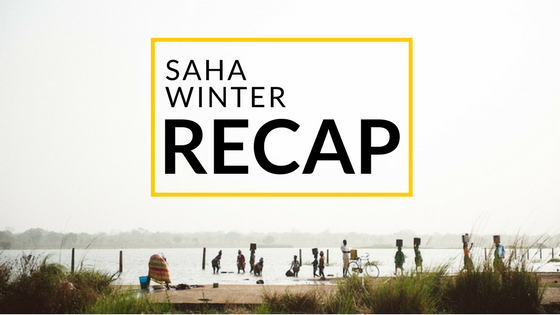 It’s been just over 1 month since our #Saharmattan 2018 winter program businesses opened! We’ve loved getting to know our 16 newest entrepreneurs and chat clean water with new families! There have been highs, there have been lows, but we are committed to working in these villages for at LEAST another 119 more months, so we know this is just the beginning. Click on the links below for a summary of how each new business is doing by the numbers, followed by our monitoring transcripts. Some of the January monitoring transcripts are missing, since we transitioned to a different survey January 20th and it took a week or so for us to work out the kinks! Before you wade into the messy details of Saha data, here are some quick explanations of what numbers mean, how we collect them, and why certain things look the way they do. If you are a data viz wiz, feel free to skip right to the fun stuff. Visits to the Village – this is just in the first month! More recent visits aren’t included in this summary. Graph of Percentages of Households (HH) with Polytank Water (PT) – look at the Y axis! These graphs do not span from 0% to 100%. In Nomnayili, for example, the graph goes from 65% to 100%. Savings – This graph charts responses to the question, “How much do you currently have saved for replacement parts?” So it can fluctuate based on expenditures or even who you talk to! And now – THE SUMMARIES. Kujeri – *spoiler alert* sadly, the dugout has dried out, but the women are working to get a motorking to bring water. This means they pay an off-roading tricycle to drive to another source of water transport water back in storage containers, for a fee. Of course, Saha will be there to help the business restart once it rains again and the dugout stores water. 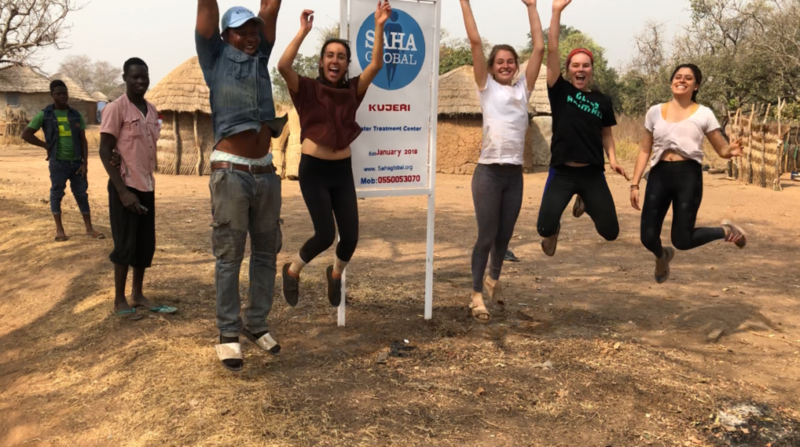 While difficult for the community, it’s not uncommon for dugouts to dry out as the dry season continues, and at Saha we believe we would rather people have clean water for as many months of the year as possible. And the good news is that, like in Kujeri, there are ways to transport water from other sources to treat (though this added cost and logistics management makes the business a little more difficult to run). 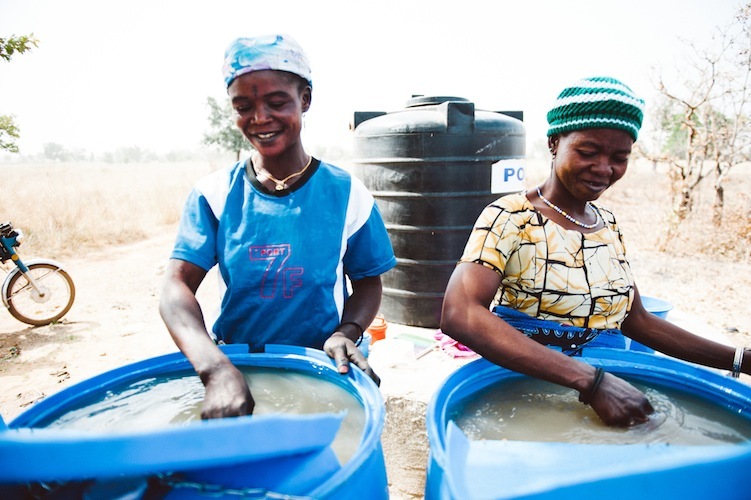 You’ll see this reflected in lower percentages of households that have clean water, or empty polytanks – indicators to our team that operations are not business as usual. Ultimately, we find that once the rain fills the closer source again, it’s pretty easy to get the business back up and running again. Check out these blog posts on seasonal transitions to read more context. Naviali Guma – *spoiler alert* sadly, the stream has dried out, but the women have moved the center to town and are working with a motoking and have increased prices to cover the cost of transportation. Read the Kujeri spoiler for more seasonal explanations. Saha will be there to help the business restart once it rains again. 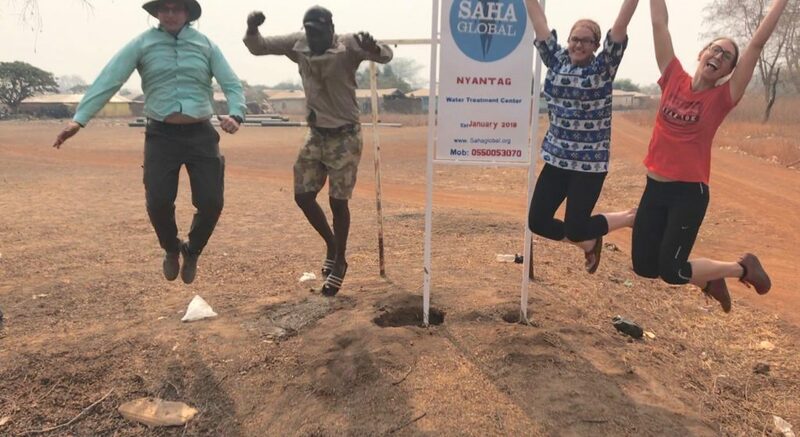 If you have any questions, email our awesome Operations Coordinator, Heidi at heidi@sahaglobal.org . We’re figuring out how to make it easier to check up on your village’s status, so stay tuned to our “sustainability” page. It’s been just over a month since we said goodbye to the 2018 Winter Field Reps. 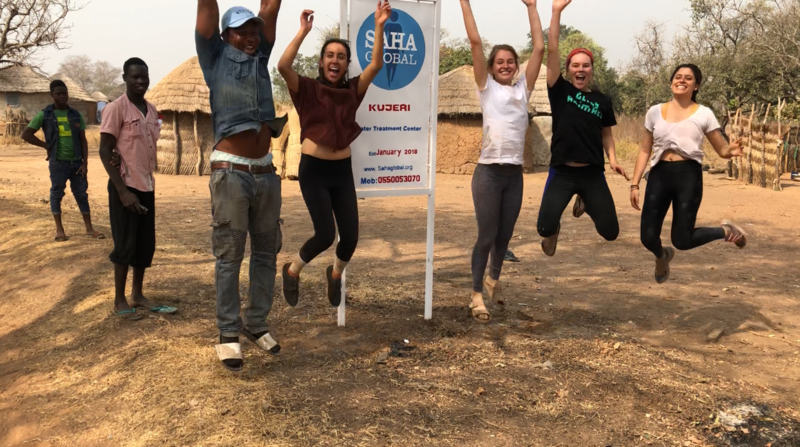 Thanks to this awesome group students and young professionals, Saha was able to partner with with 4 more communities in Northern Ghana to open new water treatment businesses. Because of them, over 1,000 more people now have the ability to drink clean water each day. 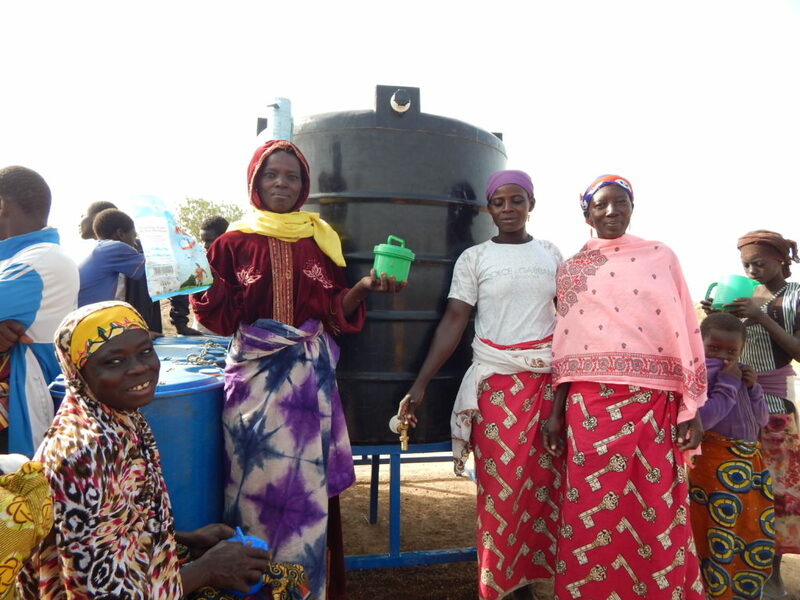 16 women entrepreneurs are able to provide potable water to their friends, family and neighbors through community-supported small businesses. 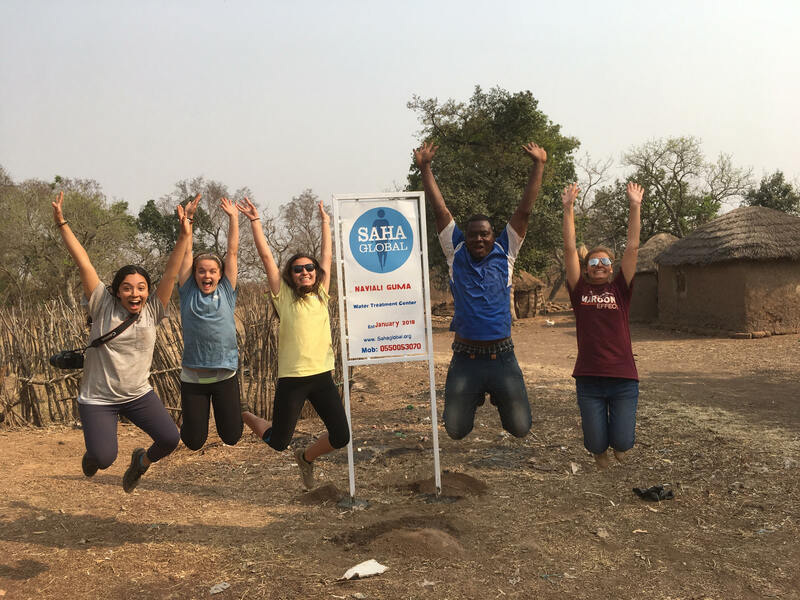 And Saha is able to welcome 15 new faces to our global Saha family! We did it! We powered through the unanticipated busses and breakdowns and survived the first hours of 2018. We rolled with the punches and found joy and success in the unexpected! Though not every moment was easy, all the (literal) blood, sweat and tears paid off. and all of us here at Saha, and let us know what we can do to further your missions. Stay tuned for 1st month business updates this week, right here. This is the village of Nomnayili, located in the Northern Region of Ghana. Nomnayili is a rural village full of large cotton trees, roaming goats, sheep, chickens, and kind, hard-working people. There are 26 households of Dagomba tribe people in the community and 18 households of Fulani just outside of the community (approximately 340 people). Fulani are a semi-nomadic group of people that raise cattle and usually live on the outskirts of a village. They come from different areas of Africa, so many of them speak different languages as the Dagomba communities. Yesterday, January 12th our village had its opening day for the water treatment center! 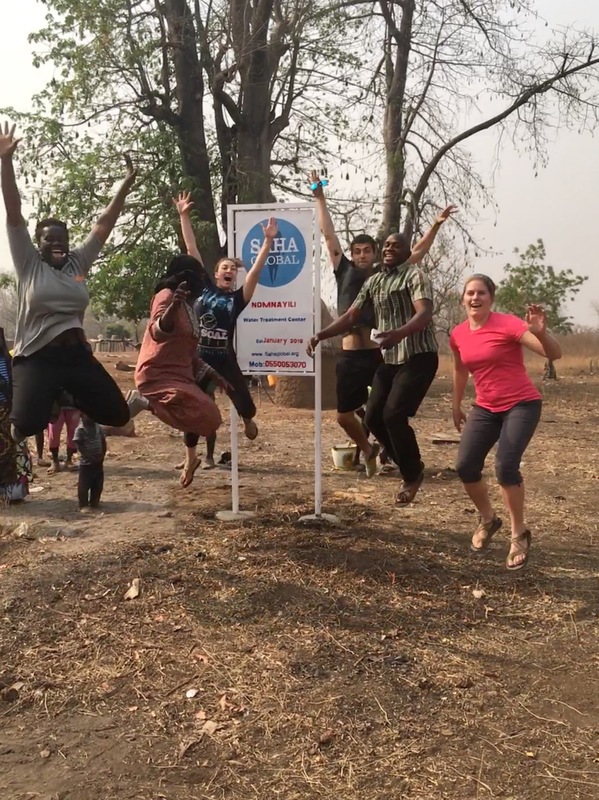 Our team and the business women were so excited to distribute the clean water! They have worked so hard learning and treating the dugout water over the last week. We pulled up to the village around 8 am and walked to the dugout. On the walk, we passed many women carrying bins on their heads and we were a little worried they might have already fetched water for the day. After waiting a few minutes we saw the business women walking towards the dugout with buckets balanced on their heads (never ceases to impress me). 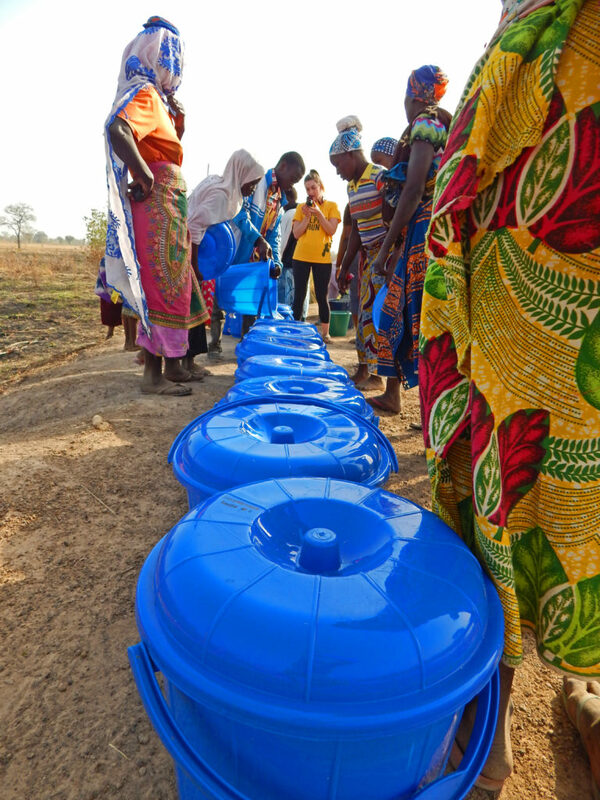 Moments later, many blue buckets carried by women and kids from the village began to pour in. The business women were totally ready; they already had a perfect system in mind for washing, testing for leaks, and filling the storage containers. All of the containers were lined up, washed and filled with clean water. It was amazing to see the women and kids so happy and grateful to have a sustainable way of attaining a resource that is a basic human right. 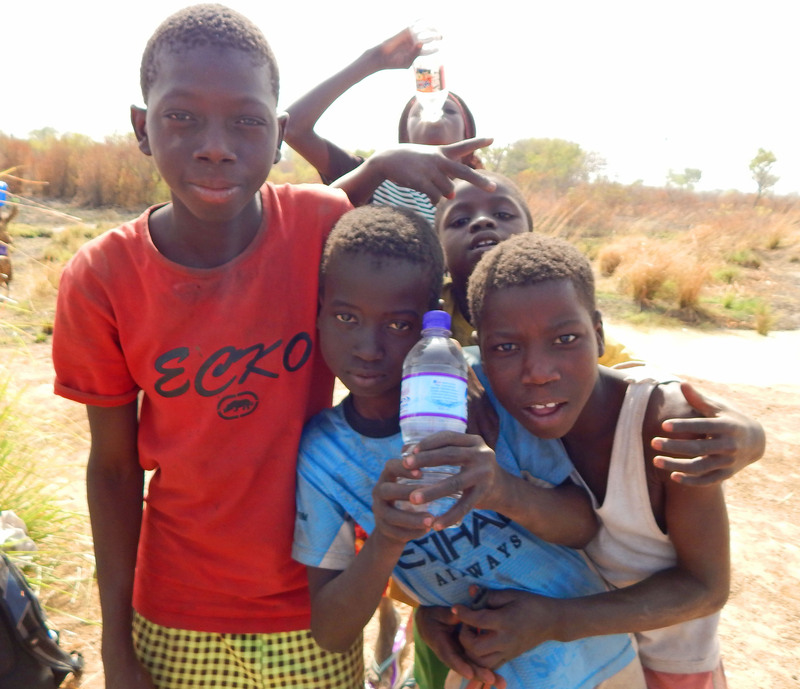 The kids were downing water bottles that they filled with the treated water, which was a strong contrast to seeing them scoop up dug out water to drink just days before. 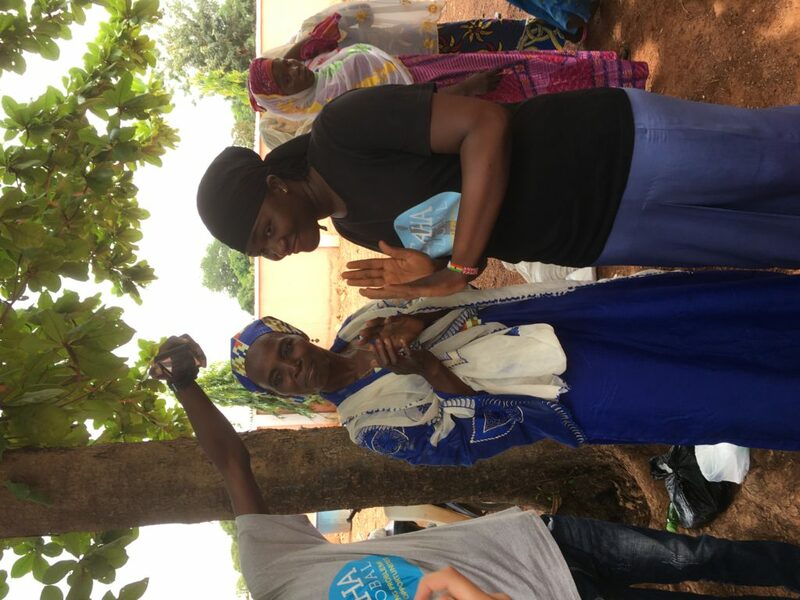 Mariama, one of the business women, was so happy that she was clapping and dancing when we finished. We tried to teach the kids how to do the footloose dance, but they were being shy and just kinda stared at me. However, the kiddos sure do love having their picture taken! All the Dagomba households came and left with their filled buckets, but we still hadn’t seen the Fulani households. After sending a couple of kids to spread the word that the center was open, the Fulani began to pour in. At first they were a little hesitant (remember they don’t speak the same language), but after showing them some direction their buckets were filled as well! 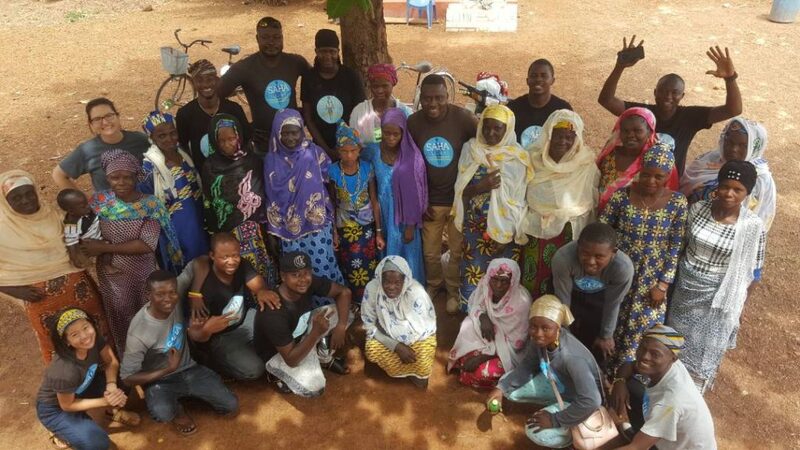 It was great to see the two communities working with each other so that everyone has access to clean water. By the end of the morning, all but one household showed up to fill at least one bucket with water! The Polytank ran out after the last bucket, but the women already had settled water to add and treat with chlorine. 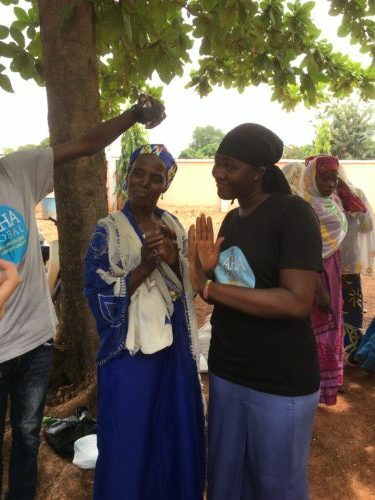 To finish off opening day, Mariama told us how grateful she and the other business women are for the water treatment center and all of our help. The truth is, we didn’t do too much other than bring the materials and the process. We learned a lot more from them about having a positive attitude and being thankful for everything that we have.